Nokia Windows Phone users will no longer have to jump through hoops to get Windows Phone 8.1, as the update is now rolling out to all users. Since April, Microsoft has allowed anyone to install Windows Phone 8.1 by signing up for a developer preview. But this process, however simple, does temporarily void users' warranties and leaves out any additional features from the phone maker. With the official "Lumia Cyan" update, Nokia is delivering extra features on top of Windows Phone 8.1. The company says it's simplified the interface for the Nokia Camera app, so it's easier to edit and share pictures, and the Camera Roll will include direct access to Nokia's Creative Studio 6 editing tools. Nokia is also adding a "Device Hub" for connecting to other products and seeing where you last left them. Lumia 1520 and Lumia Icon users, meanwhile, are getting tweaks to the camera, including better colors and low-light performance, continuous autofocus and RAW DNG image improvements. Nokia says it's also improving audio quality in videos through Dolby Digital Plus 5.1 and Nokia Rich Recording. As for Windows Phone 8.1, it's a significant update that includes a drop-down bar for notifications and quick settings, a gesture keyboard, the Cortana virtual assistant and numerous other improvements to the phone's built-in apps. 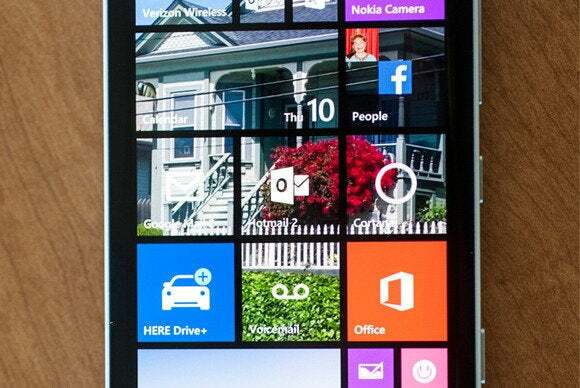 Check out our full rundown of Windows Phone 8.1 for more details.